Early in 1984, Bill Birch Reynardson asked Herry to leave P&I and help start a new Miller club for shipagents and shipbrokers, known as TIM (Transport Intermediaries Mutual). Herry was reluctant to do so, knowing very little of that world and enjoying being the manager of Syndicate 1 with its collection of Japanese, Indian, Australian and blue-chip Greek Members. However Bill persisted and Herry left International House in September to move across the road to Creechurch House where the new office was being set up. Prior to his move, he had had a day with Francis Frost, the creator of the concept of TIM, at his house in Suffolk, and been convinced that it could work, and be amusing! He joined his partner Charles Goldie, who was to be the eminence grise on the project, Malcolm Bird and Geoffery Room, both of whom had been seconded to it and been working on it for some time. Herry's long-time secretary Jo Johns also came with him. Martin-Clark also gave a great deal of moral and practical support and found a friend, Richard Harwood, to set up the IT system, as well as a retired Lloyd's underwriter, Graham Williamson, to help set up the underwriting system. Together they recruited staff, initially Chris Childs and Sid Lock and later Tony Payne and Julia Mavropoulos. Click here for a photo of the staff in late 1984. Their earliest work was on settling the Rules, which they did with the great help of Geoffrey Slater of Coward Chance. The first major meeting with the future board of ITIC came in October when we travelled to Tarrytown in New York to discuss the plans for the club, its finances and the all-important cover provided under the Rules. Bill Birch Reynardson accompanied Herry and they together met the board, already largely chosen by Francis Frost, to be chaired by Jorgen With-Seidelin from San Francisco. Herry presented the Rules in a long-lasting session and they were approved; and it was agreed that the Club would begin marketing immediately and take Members from 1st April 1985 (though some were given interim cover though a market placement so that they didn't have to renew with their existing insurers). The Club grew quickly and secured the entries of a number of major players including Inchcape, GAC, Jardines and Clarksons. It was also supported by the Multiport network of agents a well as by the Baltic Exchange. With his P&I background, Herry was naturally involved with the shipmanagement industry and was able to persuade the major players, including Wallem, Denholm and V Ships to join up. Later he helped to draft the now universally adopted BIMCO shipmanagement and crew management agreements as well as contributing the liability chapter to the LLP book on the subject. Soon after TIM was established, Tindall Riley, fellow club managers to Thomas Miller, took over the management of an old (1925) club called CISBA, run for many years by solicitors, Hedleys. The revived CISBA provided some competiion to TIM, but was never as successful and, prompted by his partners, particularly David Martin-Clark, Herry set about arranging a merger between the two clubs. This was successfully completed in 1990 and the merged club was renamed ITIC - International Transport Interemediaries Club - with Millers as managers. Several Tindall Riley staff joined the new management company, including Phil Mitchell, who became deputy chairman to Herry. The board of the club met three times a year, once in Bermuda where the club was registered and the others at various international locations. Click here for a photo of a board meeting in Hamburg in 1991. ITIC moved from Creechurch House to America House in 1990 and then to International House. 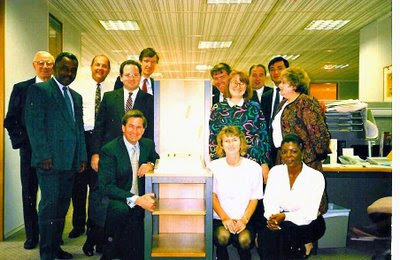 Click here for a photo of the staff in the America House office in 1990. Herry returned to P&I in 1993 and ITIC, which continues to flourish as the largest insurer of marine-related intermediary risks in the world, was successively led by Francis Frost and then by Peregrine Massey.